Oral presentation by Rafael Nebot Medina (Technological Institute of the Canary Islands, Spain) at the 10th International Multi-Conference on Complexity, Informatics and Cybernetics (IMCIC 2019), 12-15 March 2019, Orlando, Florida, USA. Presented in the Session on e-Health, Science and ICT on 15 March 2019 (see program here). 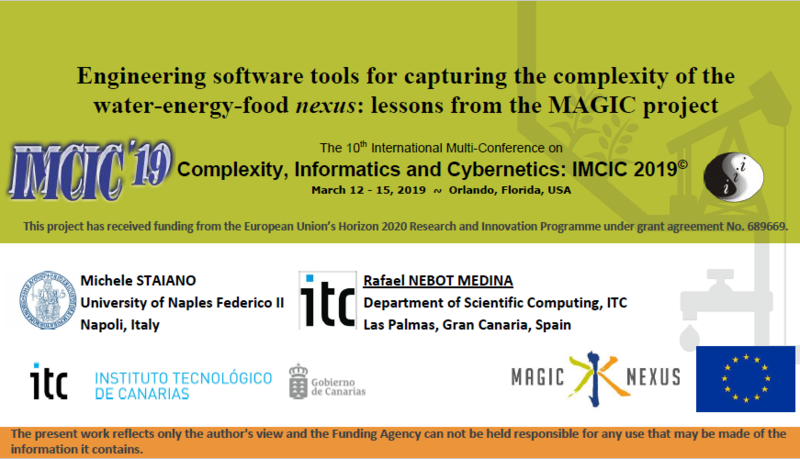 Quote as: Staiano M & Nebot Medina R (2019), Engineering Software Tools for Capturing the Complexity of the Water-Energy-Food Nexus: Lessons from the MAGIC Project, presentation at the 10th International Multi-Conference on Complexity, Informatics and Cybernetics (IMCIC 2019), 15 March 2019, Orlando (FL), USA.